Preheat oven to 425°F. Grease a 9x13 inch baking dish with cooking spray or olive oil. 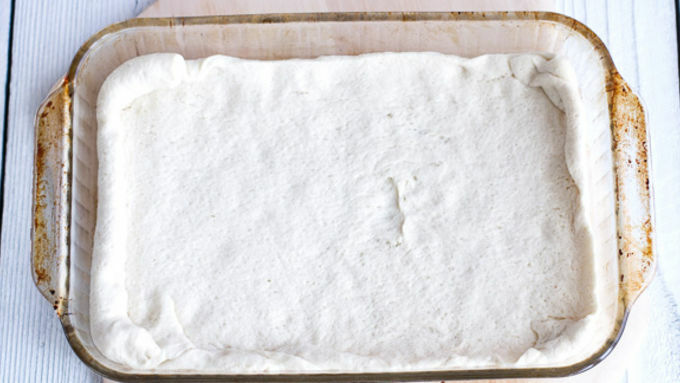 Unroll the pizza dough, and press it into the bottom and halfway up sides of prepared baking dish. Spread the dough with some pizza sauce and, if using, sprinkle the cooked spicy Italian sausage over the top. Cover the pizza with cheese and then top with pepperoni (if using). Sprinkle the Parmesan over top. Bake for 15-20 minutes or until crust is golden brown and the cheese is melted. Remove from the oven and sprinkle with more Parmesan if desired. Serve immediately. 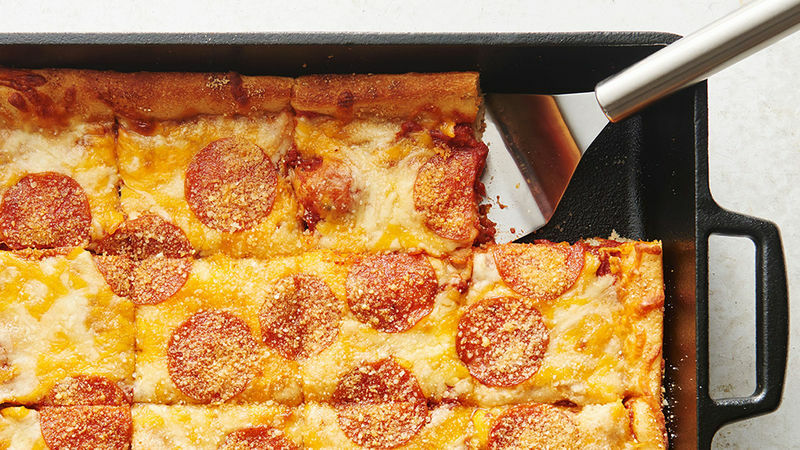 This pizza is just insane – insanely good and insanely easy, that is. It honestly takes just 5 minutes to prep and then into the oven it goes. FIVE minutes! 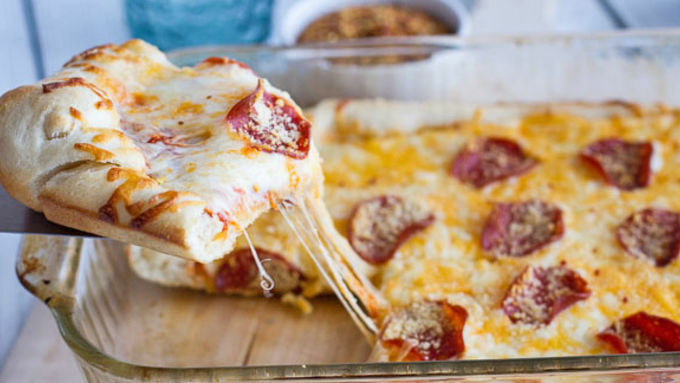 The ease of this pizza casserole is pretty amazing, but it’s the taste that gets everyone. We're pretty sure there is not one person on the planet that will not fall in love with this dish. 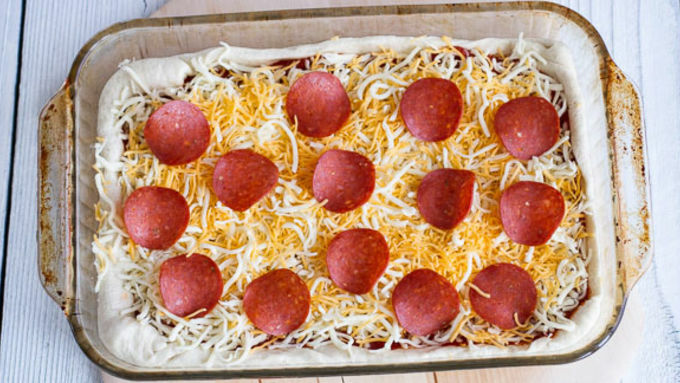 You will need just three basics: Pillsbury™ pizza dough, pizza sauce and cheese. You can customize it to your liking by adding spicy sausage or other meats, your favorite veggies, or a variety of cheeses. Or just keep it super simple and top the pizza with some pepperoni and (tons) of cheese. The extras are all up to you, but just make sure if you are using any meat that it is pre-cooked. After your pizza goes in the oven, start checking for doneness after 15 minutes. You want the dough to be nice and soft and lightly golden. Cut the casserole into squares and dig in!